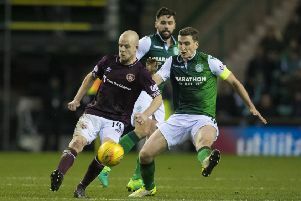 Hibernian head coach Paul Heckingbottom believes it will be stranger for Neil Lennon returning to Easter Road than for him facing his predecessor. Lennon makes a swifter return to Leith than anyone could have anticipated a few days ago after taking charge of Celtic in the wake of Brendan Rodgers’ sudden departure to Leicester. After leading Celtic to victory at Hearts before he had even taken a training session, Lennon now faces another trip to Edinburgh to face Hibs in the William Hill Scottish Cup quarter-finals on Saturday. The match comes just four weeks after Lennon’s departure from Hibs was confirmed following rumours of acrimony behind the scenes, although a club statement failed to clear up the reasons, stating he had neither been sacked nor resigned. Heckingbottom, who has won his first three matches in charge, now faces a bigger test against a man who knows his squad inside out. “He’s going to know the players but he’s not going to know what we ask them to do,” Heckingbottom said. “That stuff happens every week, we have players who knew lots about St Johnstone players and staff. You do your homework on teams and players. “For me, it’s the same. For Neil, he is coming back somewhere he has worked before, which is always strange, always different. “But for me it’s no different. It will be different for Neil coming back to his old club. It’s always a different sensation. Heckingbottom admits he endured some difficult feelings when managing Leeds against Barnsley last year, about 10 weeks after leaving Oakwell for their Yorkshire rivals. The match came three games before the end of the season and proved to be a costly blow in Barnsley’s hopes of staying in the Sky Bet Championship. “It was tough because Barnsley came to Elland Road needing the points to stay up, and we beat them,” he said. “When you’re doing the job, you are desperate to beat them because we needed the points as well. It was a really important game. When asked whether he received a reception from the visiting fans, Heckingbottom said: “Yeah, a brutal one.